In my ever increasing interest in the Warsaw ghetto uprising, I've been gathering books from various libraries to try and wrap my brain around the perilous and courageous act of the Jews of Warsaw during 1943. 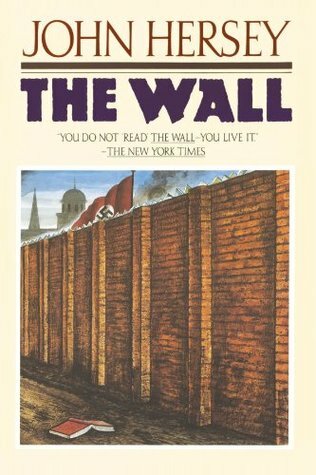 One of the books in my pile was The Wall by John Hersey, a 640 page novel that I honestly wasn't sure I'd get around to any time soon. But then I read the first few pages and I was hooked. It was a lot to take in. I feel like I need to read it a few more times to fully understand everything. The story opens with four survivors of the Warsaw ghetto finding the buried Levinson Archives. Noach Levinson is a Jewish historian who documents life in the ghetto from 1939-1943. Levinson—a recluse—is forced to move in with strangers when the ghetto is formed. But they become like family to him as the story progresses. The cast of characters are diverse and entertaining. Levinson finds, to his great surprise, that he rather enjoys being apart of a family. He writes of the day to day struggles of living in filth, poverty, and persecution. You see the hard and sometimes horrible choices people had to make in order to survive. 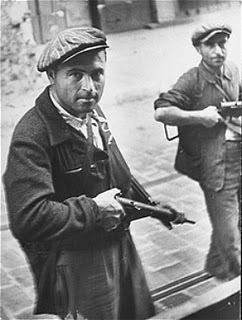 When the Nazis start to deport the Jews to Treblinka, the Jews make the choice to fight back. They begin smuggling in weapons and the Z.O.B. (Jewish Fighting Organization) is formed. The family is broken up by the "relocation" but those who are left take up arms, build bunkers, and prepare to fight back. It's all fictional, but the archives are so believable that at first I thought they were real. The historical accuracy is amazing, and although Hersey changed the names of actual historical people, I was able to recognize some of them from previous research. Noach resembles Emmanuel Ringelblum, Jewish writer whose archives were discovered buried in an underground bunker. Rachel Apt's leadership is very similar to Zivia Lubetkin. Yitzhok, I believe, is intended to represent Mordechai Anielewicz. The head of the Judenrat is most definitely based on Adam Czerniaków. The writing is beautiful. It's one of the books you feel enriched by every time you pick it up. It's full of pain and bravery, horror, and determination. It's a hidden gem of a book that I'm very glad that I found. Have you ever read The Wall? I saw this on your goodreads while you were still reading it. I definitely marked it as to read, and definitely am going to try to find it at my library! It sounds interesting! I'll have to check it out. So you didn't find it a struggle to read that many pages? Also, that quote has really got me thinking. I think I have something to learn from it. Thanks for sharing! Surprisingly, no! It was really engaging. Me too! That quote really makes me think.